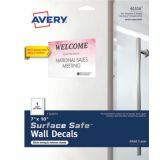 Easily create custom signs with no damage to walls using our Surface Safe Wall Decals. The specially designed Surface Safe adhesive sticks securely yet removes cleanly from painted walls, drywall, metal and glass without any residue or damage to surfaces. Great for printing personalized signage for offices, special events, classrooms, retail stores, home and more. The sign labels are made of durable, professional-grade material and engineered to resist water, chemicals and abrasion. And with no tape, nails, pins or bolts required, it's a great way to hang signs to help avoid fines or repainting walls. 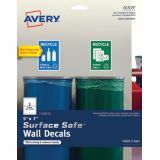 Easily customize your signs using a laser or inkjet printer and the free templates and designs at avery.com/templates. Self-sticking removable labels. 3⁄4" diameter. Pack of 1,000. 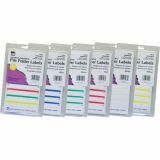 Self-sticking labels feature permanent adhesive. 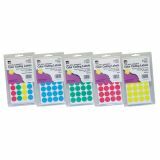 Great for color-coding and organizing files. 9⁄16 x 3-7⁄16". Pack of 248. 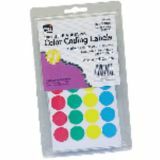 Self-sticking labels feature permanent adhesive. 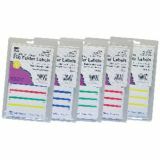 Great for color-coding and organizing files. 9⁄16" x 3 7⁄16". Pack of 248.